IF YOU AND YOUR DOCTOR DECIDE THAT BRANDED FOCALIN XR® IS RIGHT FOR YOUR TREATMENT PLAN, TALK TO YOUR DOCTOR ABOUT STAYING WITH IT. HAVE QUESTIONS ABOUT OUR $10 CO-PAY OFFER? VISIT OUR CO-PAY FAQs PAGE FOR ANSWERS. *Offer not valid under Medicare, Medicaid, or any other federal or state program. Limitations apply. See Terms & Conditions for details. Get a new card or activate a card that you already have. You must activate your card before you use it at the pharmacy. co-pay card to your pharmacy. Present the cards to the pharmacist along with your prescription. 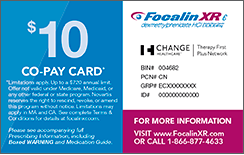 Bring your co-pay card with you to the pharmacy for future fills so that you can save on every prescription. FOCALIN XR is a central nervous system (CNS) stimulant prescription medicine. It is used for the treatment of Attention-Deficit Hyperactivity Disorder (ADHD). FOCALIN XR may help increase attention and decrease impulsiveness and hyperactivity in patients with ADHD. FOCALIN XR is a federal controlled substance (CII) because it can be abused or lead to dependence. Keep FOCALIN XR in a safe place to prevent misuse and abuse. Selling or giving away FOCALIN XR may harm others, and is against the law. Tell your doctor if you or your child have abused or been dependent on alcohol, prescription medicines, or street drugs. are allergic to methylphenidate hydrochloride, or any of the ingredients in FOCALIN XR. Heart-related problems: Sudden death in patients who have heart problems or heart defects, stroke and heart attack in adults, increased blood pressure and heart rate. Tell your doctor if you or your child have any heart problems, heart defects, high blood pressure, or a family history of these problems. Your doctor should check you or your child carefully for heart problems before starting FOCALIN XR and then check blood pressure and heart rate regularly during treatment with FOCALIN XR. Call your doctor right away if you or your child has any signs of heart problems such as chest pain, shortness of breath, or fainting while taking FOCALIN XR. Mental (psychiatric) problems: New or worse behavior and thought problems, new or worse bipolar illness, new or worse aggressive behavior or hostility, new psychotic symptoms (such as hearing voices, believing things that are not true, are suspicious) or new manic symptoms. Tell your doctor about any mental problems you or your child have, or about a family history of suicide, bipolar illness, or depression. Call your doctor right away if you or your child have any new or worsening mental symptoms or problems while taking FOCALIN XR, especially seeing or hearing things that are not real, believing things that are not real, or are suspicious. FOCALIN XR may not be right for you or your child. if you are pregnant or plan to become pregnant. It is not known if FOCALIN XR will harm your unborn baby. Talk to your doctor if you are pregnant or plan to become pregnant. if you are breastfeeding or plan to breastfeed. FOCALIN XR passes into your breast milk. You and your doctor should decide if you will take FOCALIN XR or breastfeed. Tell your doctor about all of the medicines that you or your child takes, including prescription and over-the-counter medicines, vitamins, and herbal supplements. Do not start any new medicine while taking FOCALIN XR without talking to your doctor first. What are the possible side effects of FOCALIN XR? painful and prolonged erections (priapism) have occurred with methylphenidate. If you or your child develops priapism, seek medical help right away. Because of the potential for lasting damage, priapism should be evaluated by a doctor immediately. circulation problems in fingers and toes (peripheral vasculopathy, including Raynaud's phenomenon), where fingers or toes may feel numb, cool, painful, or may change color from pale, to blue, to red. Tell your doctor if you or your child have numbness, pain, skin color change, or sensitivity to temperature in the fingers or toes. Call your doctor right away if you have or your child has any signs of unexplained wounds appearing on fingers or toes while taking FOCALIN XR. slowing of growth (height and weight) in children. Children should have their height and weight checked often while taking FOCALIN XR. Treatment may be stopped if a problem is found during these check-ups. FOCALIN XR can be taken with or without food. Do not chew, crush, or divide the capsules or the beads in the capsule. If you or your child cannot swallow the capsule, open it and sprinkle the small beads of medicine over a spoonful of applesauce and swallow it right away without chewing. Please see full Prescribing Information, including Boxed WARNING, and Medication Guide .